PALAPPAM (പാലപ്പം) refers to the Nasrani dish of fermented bread made with rice batter and coconut milk and hence the name Palappam (meaning Milk Bread). Jewish people who migrated to India introduced this item in the country. 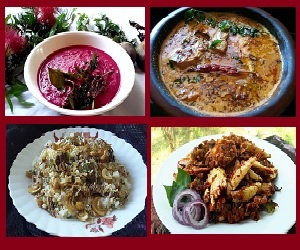 It is a staple diet popular in South India and Srilanka. 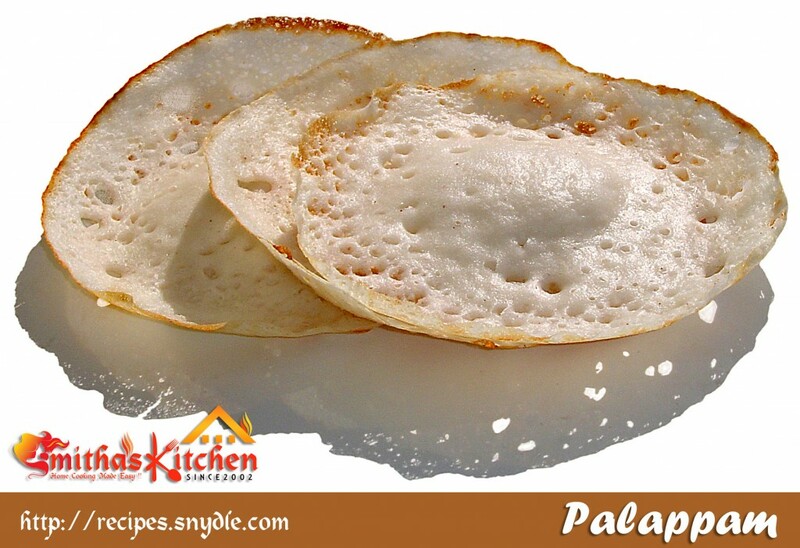 The batter for Palappam is made by grinding raw white rice with grated coconut and then fermented with toddy or yeast. The Palappam has got lace boarder and is cooked only on one side by covering it. The Palappam is prepared in curved pan which is called Appachatti. Wash and soak raw rice in normal water for 5 to 6 hours. Drain the soaked rice and grind it with grated coconut and the cooked rice in a wet grinder using required amount of normal water or fermented sweet coconut water if available. Before start grinding the rice, take ¼ cup of lukewarm water in a bowl, add yeast and sugar and keep it for 5 to 6 minutes for fermentation. Once the yeast fermented, add it fully to the rice and start grinding. The batter consistency should be similar to the dosa batter. Remove the ground rice batter to a big vessel and keep it overnight in a warm place to ferment. Once it is fermented and rises, check the consistency. If it is too thick, adjust consistency by adding coconut milk and water and make it into a semi thick batter. Add salt into the batter, mix well and keep it for 15 to 20 minutes. Heat a non-stick pan (appachatti), pour a medium ladle full of batter and spread it by rotating the pan. Cover it with a lid and cook it for 1 to 2 minutes on medium flame. When the edges of the appam turn light brown; remove it from the pan to a casserole. Serve hot with Vegetable Stew, Chicken Stew, Curry or Roast, Beef Curry or Roast, Fish Molly or Egg Roast. As the batter quantity increases during fermentation, use a vessel which can contain double the quantity of the ground batter. Each time you take batter from the vessel to prepare the Palappam, stir it well.